What was distinctive about Guttmann’s regime? Guttmann was singleminded about making the Stoke Mandeville spinal injuries centre a success. He fought doggedly for what he believed in and his staff and his patients were simultaneously devoted to him and terrified of his manner. 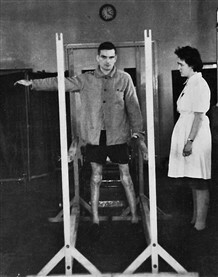 Guttmann was not only the “father of the Paralympic movement” but also a very important figure in the development of treatment for spinal injuries. He became President of the International Stoke Mandeville Games Federation and also founded the British Sports Association for the Disabled in 1961. In that year he also became inaugural President of the International Medical Society of Paraplegia (now known as the International Spinal Cord Society) as well as being the first Editor of the Society’s journal, Paraplegia. He travelled extensively for the Society’s meetings, which largely took place alongside the Games. 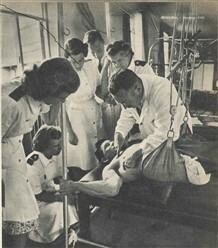 Guttmann received the OBE and the CBE from the Queen, and was knighted when he retired in 1966.